It’s Friday evening out on the deck in St. Louis… a time to wind down from a busy and stressful work week. Most Americans are feeling the pinch of a tough economy these days and are embracing time at home for their weekend relaxation. ‘Staying in’ can be peaceful, economical and simple. And a simple lifestyle is proving beneficial for the mind, body, soul.. and pocketbook! 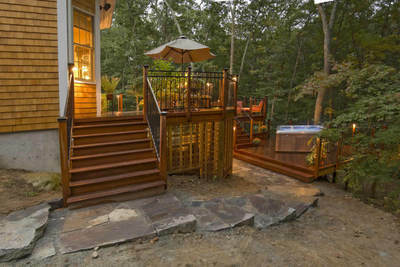 So it’s not surprising that publications such as Realty Times and best-selling authors like Martha Baker, The Outdoor Living Room, write about today’s consumer looking outside their own doors for inspiration to create aesthetically pleasing and comfortable spaces: decks, screened porches, gazebos. Lighting impacts all aspects of life and lighting for your deck, porch or gazebo extends the time you can spend enjoying your outdoor space with your family or guests. 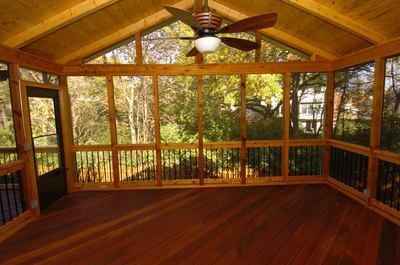 Experienced contractors will offer a variety of deck lighting styles, sizes, shapes, colors and sources, including solar. Archadeck’s lighting partners include Aurora, TimberTech, and Deckorators, just to name a few. Lighting can be a low voltage subtle glow for post cap modules, accent lights, ceiling lights for porches and gazebos or safety lights for illuminating steps and risers. Deck lighting sets the mood. Deck lighting feels cozy. Deck lighting adds safety. It’s all about ambience. So as summer transforms to autumn, light up your deck, porch or gazebo… it’s Friday Night! Visit us on the web, Archadeck of West County and St. Charles County in St. Louis, for more information about adding an outdoor living space with lighting for your home. We serve the Greater St. Louis area including St. Charles and parts of Illinois. If you reside outside of the St. Louis and surrounding areas, go to archadeck.com to find other Archadeck offices across the country. « Archadeck St. Louis: We’ve got the building ‘know-how’.